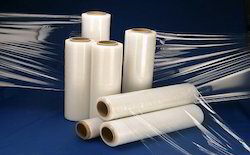 We are a leading Exporter of machine roll stretch film, hand roll stretch film and pre stretch film from Delhi, India. For our reputed clients, we are highly efficient in manufacturing and supplying a distinguished spectrum of Machine Roll Stretch Film. It is frequently used to wrap, and it is ideal for bundling and unitizing a number of small, individual, irregular shaped items into larger loads. These provide perfect clarity for scanning labels. These films are used for identifying, differentiating and color coding products when storage and shipping. Black films conceal shipments to deter theft and protect products from fading due to exposure to the sun. Also, our products undergo stringent quality checking procedures in order to supply flawless range to customers. 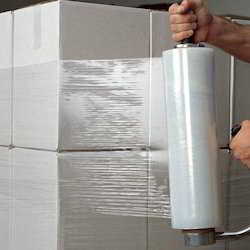 With the endorsement of our skilled professionals, we are extremely engaged in manufacturing and supplying a vast range of Hand Roll Stretch Film. In addition to this, our offered machine is provided on numerous specifications at industry leading price within a confined time. This is frequently used to wrap, and it is ideal for bundling and unitizing a number of small, individual, irregular shaped items into larger loads. High yield point, make packaged goods more tightening. 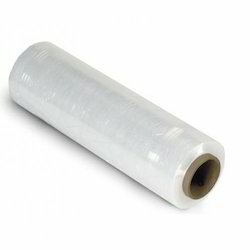 We are amongst the most renowned entity, widely engrossed in providing a comprehensive spectrum of Pre-Stretch  Film. This is primarily used in pallet wrapping and storage operations to stabilize and hold loads together, but also keeps your products clean and dry. It is designed to cling tightly to objects and provide a secure overwrap to protect goods from shifting during transport. Moreover, we provide this film in several specifications as per client’s requirements. Great ideals for protecting goods from moisture, rust and dirt.